Blake Landscapes, Inc., is a locally owned and operated company built on a foundation of values and a genuine dedication to providing the highest quality commercial and residential landscape management, landscape construction, and snow removal services in Northern Virginia. With more than six decades in the landscape contracting industry, our professionals understand the business from every angle. We understand how to incorporate the customer perspective to produce the best results. Our experienced team of horticulturists, estimators and maintenance crews will ensure that your property receives expert care at competitive rates. Our construction team offers clients a wealth of design, enhancement and installation experience for a wide variety of construction projects. Our customers have come to rely on dependable year-round results that consistently exceed expectations. We welcome the opportunity to build such a relationship with you. From complete grounds maintenance to custom installations, Blake Landscapes is your vendor of choice. Blake Landscapes began in 1951 as a sole proprietorship owned and operated by World War II veteran Ronald W. Blake. In its early years, the firm specialized in seeding, sod, and landscape planting for property owners, contractors and governments, including the Virginia Department of Transportation. In 1974, the firm created its Landscape Maintenance Division, which offers landscape maintenance services to homeowners associations, developers, real estate management companies and government agencies. Blake Landscapes incorporated in 1986. Mr. Blake retired after 47 years in the business and sold his stock in the business to the employees. Today, owners Jay Frye and Brad Yurish manage the day-to-day operations of the company’s three divisions and approximately 100 employees. We’ve seen many highlights over the years, including when Blake Landscapes was selected by Brown and Root, one of the world’s foremost large project contracting firms, to provide the landscape installation for the Dulles Greenway. We attained another longtime goal in 2011, when we were selected as the grounds maintenance contractor for Dulles Airport and we opened our satellite office there. But no matter who the customer – from major corporations to government agencies to the many homeowners we serve – taking care of every property as if it is the most important one in the world is the highlight of our day every day! Everyone at Blake Landscapes takes great pride in serving our customers, and a big reason for that is that Blake Landscapes is a great place to work! 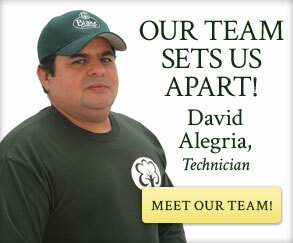 Most of our employees have been with us for 10 years or more and some for more than 20. Blake Landscapes is a company where hard work and loyalty pay off. We offer health insurance to our employees and their families as well as vacation, sick leave and retirement plans. We also participate in the federal governments E-Verify program, ensuring that all new hires are legally eligible to work in the United States.